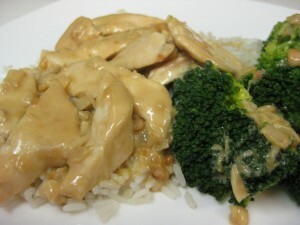 If you like Thai food you will love this quick and easy Peanutty Chicken. The original recipe was for a sauce to spoon over whole chicken breasts which you could still do but my family loves the sauce so much that I increased the sauce and cut the chicken into strips so that you get more sauce with every bite. You can “tweak” this recipe to your tastes by using the smaller amounts given in the recipe to start with. Taste, then add more if you like. If you are new to cooking, taste the sauce as you add each ingredient so that you learn what flavour it adds to the sauce. 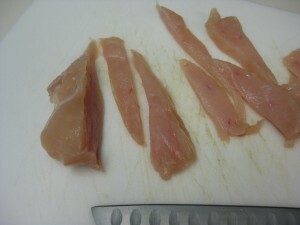 Chicken breasts cut into strips more easily when partially frozen (or partially thawed). 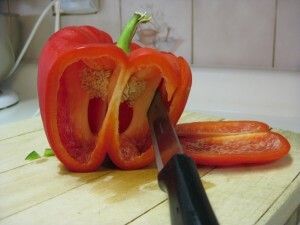 Cut across the grain with a sharp knife. Depending on the thickness of the chicken breast, I sometimes cut the slices in half on an angle for more bite sized pieces. Whenever you need chopped onion in a recipe, chop a whole large onion. Use what you need, then store the rest in an airtight container or freezer bag for next time. So much quicker to have onion already chopped. USE A FRESH LIME!! The difference in flavour is incredible and they are so inexpensive at produce markets. Get a juicer you find quick and easy to use! (I don’t mean the big electric ones.) You will get more juice than just squeezing. Use a rasp for finely grated lime zest. Fresh ginger keeps well wrapped in plastic wrap in the fridge or can be frozen and then grated from the frozen state. Peeling is optional. If you use the grated ginger from a jar, it may have a bit less flavour and you may wish to use more. Saute chicken strips in lightly oiled frying pan over medium-high heat until browned. You do not have to cook them completely. Remove to a separate plate. Saute onion and garlic in drippings, adding a little more oil if necessary, over medium heat until softened but not browned. Add remaining ingredients in order given. Stir well to mix. Taste and adjust flavours adding the larger amounts or chili sauce and soy sauce if you like. Add chicken strips and simmer for about 10 to 15 minutes. Serve with rice. Many of my recipes are a result of starting with a basic recipe or two and adjusting the flavours to my liking. This peanut sauce seems to be liked by all who try it. My niece claims it is so good that she could drink it!! It can be an interesting exercise for newer cooks to taste the sauce after the addition of each ingredient to see how the flavour is affected by each. The sauce is easily adapted to your tastes by increasing or decreasing each component. The sauce itself is easy to do yet does take a bit of time preparing and adding all the ingredients. It can easily be made ahead and the rest of the meal will go very quickly. Most sauces actually benefit from allowing the flavours to sit and blend – this sauce will keep well in the fridge for a few days. When making the sauce, you may need to “help” the blender along by stopping and scraping a few times. Starting with a slower speed and building to a higher one helps. To make the peanut noodle version you see in the picture: Saute thin chicken strips (cut chicken breast across the grain and then cut each strip on an angle) quickly in a little oil in a large frying pan. Remove to a plate. Add thinly sliced onions (cut in half) and red pepper strips to frying pan and sauté until cooked as desired – I often prefer to soften the onions and peppers, you may wish to keep them crisper. Drop the asparagus pieces into the pasta water for the last few minutes of cooking time – do not overcook. Drain the pasta. Return to the pot, add the chicken, veggies, and peanut sauce. Toss and heat through. Cutting chicken strips for stir-frying. To reheat leftover in the microwave, sprinkle a bit of water around the edges before covering and reheating. This will keep even the leftovers nice and moist. This is a great peanut sauce!! Make a double batch and keep in fridge for a week or two – ready for a quick meal. 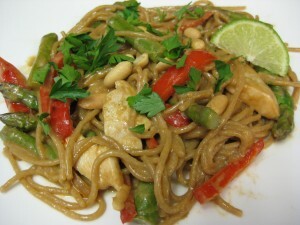 To make a complete meal, cooked pork, chicken or shrimp can be tossed with the noodles along with lightly cooked vegetables such as asparagus, broccoli, cabbage (from slaw mix) – drop into noodles for last few minutes of cooking OR stir-fry your choice of protein and vegetables then toss together with the noodles and sauce. Bring large pot of salted water to a boil. Cook noodles according to directions. Drain and reserve 1 cup of noodle water. Meanwhile, place peanut butter, chili sauce, sesame oil, soy sauce, rice vinegar, brown sugar, garlic, and ginger into a blender or food processor and blend until smooth. In a blender, you may need to stop and scrape the mixture down and/or add the water to make it blend smoothly. May need to add a little more water to desired consistency. Taste and add that extra tablespoon of sweet Thai chili sauce and more of the brown sugar if you like. A very old fashioned recipe that I remember my mother making for parties, chicken a la king is actually quite easy to put together and tastes amazing. The patty shells are not only impressive but delicious and so easy to do! Once you have your ingredients ready, it go together quickly. This mixture reheats well and can be made ahead. You could, if you really wanted to, cut down the fat by adding an extra tbsp. of flour for thickening and substituting milk for the cream. 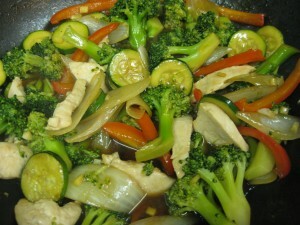 You could also sauté the vegetables in oil, not butter, though I have not tried that. I discovered the method for the patty shells when reheating some patty shells and realized that they were so much better that way – browner and crispier. The first baking can be done well ahead of time if you wish. Patty shells - ready for the second baking. 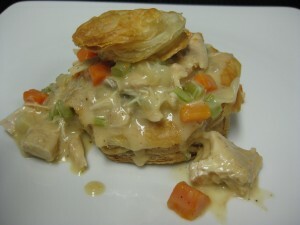 I have used this recipe for leftover turkey with rave reviews. 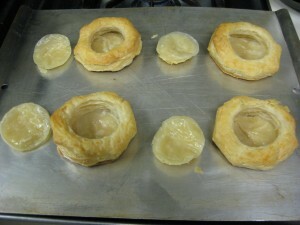 4 – 6 frozen patty shells – baked as below. First put the patty shells into the oven to bake according to the package directions. Remove to a wire rack and remove the little tops from each one. Allow to cool on a wire rack. Leave oven at 350 F. – you will rebake them later when ready to serve. Melt butter in a large pot over medium-high heat. Add onion, celery, red pepper and mushrooms, if using. 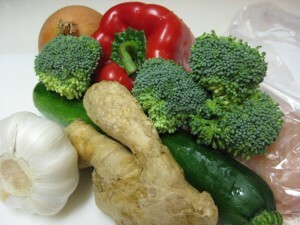 Sauté gently until vegetables are softened but not browned. Stir in flour until well blended. Gradually add chicken broth, stirring constantly. Cook and stir until the mixture has come to a boil and thickened. Season the sauce with salt and pepper to taste. Add carrots, chicken and sherry to the mixture. With a fork or small whisk, beat the egg yolk into the cream then add to the pot. Add hot pepper sauce. Bring mixture to a very gentle boil then reduce heat to low and keep hot until ready to serve. Do not allow to boil. Place patty shells and lids (separately and baked side down) on baking sheet and reheat for about 10 – 15 minutes until browned and crisp. Serve a la king in patty shells with lids on top. Makes 4 – 6 servings. This mixture would also be delicious over rice or noodles!! This is one of those simple meals that is so good to have in the oven. I got the recipe many years ago and have tweaked it only slightly. Okay – it does use cream of mushroom soup which has fallen out of favor in some circles but, done correctly, the rice in this recipe comes out tasting almost like a mushroom risotto. By done correctly, I mean just the correct number of chicken pieces, in the correct size pan and at the correct oven temperature. I use a cut up chicken which gives me 2 legs, 2 thighs, 4 breast pieces, and 2 wings. Using fewer chicken pieces makes the rice too dry. Crowding in too many pieces leaves too much liquid when the chicken is done. Any 8 or 9 pieces of all white or dark would be okay but would encourage you to do chicken with the skin and bones – much more flavour. Putting half of the recipe in an 8 X 8 glass pan should work, too, but leftovers are great!! I have tried cooking this recipe faster – the rice doesn’t cook properly!! As it comes from the oven. Serve this dish with a colourful vegetable such as the Lemon-Basil Baby Carrots. Our family loves this dish with apple jelly (used like you would use cranberry sauce with turkey) which is something I grew up with. Do try it – you might be surprised!! ENJOY!!!!!! 1/2 package onion soup mix – whole package is saltier!! 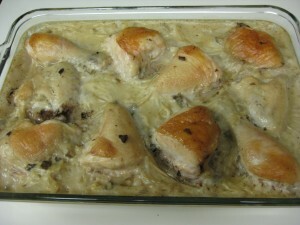 In a 9 X 13 glass baking dish, mix rice and onion soup mix and spread evenly. Place chicken on top ( there should be some space between each piece). Mix the soup and water and pour over top. Bake, uncovered, at 325 F for about 1 1/2 hours. Let stand about 10 minutes to absorb liquid if necessary. Serve with apple or red currant jelly. 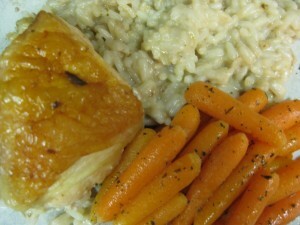 Note: The rice should be like a creamy risotto. If you crowd too many pieces of chicken in there will be too much liquid; if not enough pieces, it will be too dry. 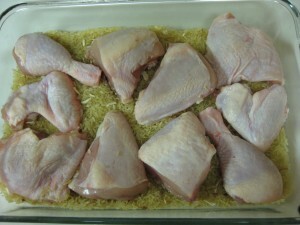 If you only want 4 pieces of chicken, cut the whole recipe in half and put in an 8X8.